This handsome book contains a wide range of photographs from the first breaking rays of the dawn of the medium until 1918, and is based on the collections of the five academies of the French Institute—Académie Francais, Académie des inscriptions et belles-lettres, Académie des sciences, Académie des beaux-arts, Académie des sciences morales et politiques. Numerous giants of early French (and English) photography are represented here: Baldus, Hippolyte Bayard, Maxime du Camp, Gustave le Gray, Nadar, W. H. Fox Talbot, and the Bisson Brothers, to name a few. The work itself is no less diverse and outstanding, having been made during the decades of an insatiable European thirst for travel and exploration, fueled in no small part by the detailed photographs which returned with many 19th century adventurers. Another gorgeous French title is Paris et la Photographie (Paris and the Photograph. 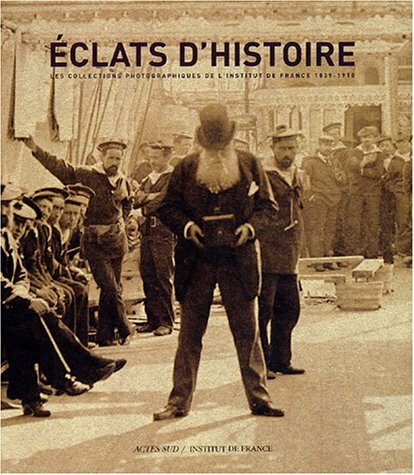 Cat# CF101H, $65.00) which traces the history of photographic activity in Paris from Daguerre's earliest images through to work by Denis Darzacq made in 2003. Each page spread is essentially a biography on a photographer with one or more signature images, exquisitely printed. Both titles are in French.